My number 1 daughter, the lovely Kelly, saw this at "The Wool Gathering" shop in Kennett Square and expressed a desire to have it. I told her I wasn't into making purses anymore but I later called and got the pattern to make it for her for Christmas. I don't think she lurks here at all so I doubt that this is giving anything away. I do not like the plastic handles they show on this bag. I'm going to have to come up with something better than that. I can't believe they even put them there. Yuck. Way to ruin a good bag. So we saw a needle felting demonstration last night. 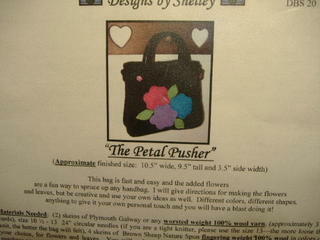 It's nothing more than pushing roving down into felted material with a special needle to make whatever design you want. You lay the fabric on a piece of foam rubber so the needle can push the roving through the fabric. It's kind of neat. The needle attaches the roving with little "barbs" so that it will never come loose. You can design free hand, or use stencils. I can see where it is something that could become addictive so I'm not going to go there. I have enough on my plate!